We’re showing more Aussie Love! 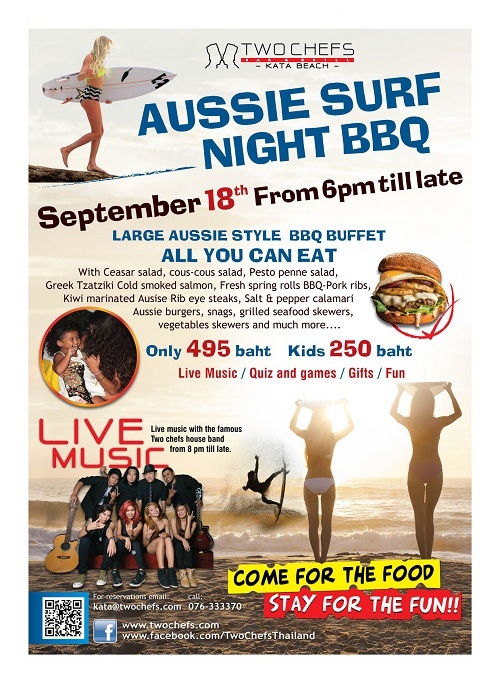 AUSSIE SURF NIGHT is back at Two Chefs Kata Beach! JOIN US this Friday 9/18/2015 from 6PM-LATE! COCKTAILS, SHOTS, DRINK SPECIALS, FOOD, AND FUN!!!! FEATURING: Kiwi Marinated Aussie Steaks, Aussie Burgers, BBQ Ribs, and More…!